The WebDiscover appeared on your personal computer without any notice? After that, you’re faced with the fact that an unwanted toolbar added to the top of Windows desktop and all of your web-browsers are now rerouted to an unknown page every time when you press browser’s home button, create a new tab or perform an Web search. The cause of all your problems with your PC is WebDiscover Browser that has been installed on many systems around the world without users permission, so you’re one of many. Most probably, you do not even know how and where this unwanted software has got into your computer. In the step-by-step instructions below, we will explain all effective methods for manually removing it from your system. Often, the PC system, that has been infected with “WebDiscover Browser”, will be also infected with adware, which will open a huge number of various advertisements. This may be pop-ups, text links in the web pages, banners where they never had. What is more, the adware may replace the legitimate advertising links with malicious ads that will offer to download and install malware and unwanted applications or visit the various dangerous and misleading web-sites. In order to delete this unwanted software, you can use the removal steps which are given below that will allow you to remove Web Discover search easily and safely. The detailed procedure can be followed by anyone as it really does take you step-by-step. If you follow this process to get rid of WebDiscover Browser let us know how you managed by sending us your comments please. Some of potentially unwanted programs, adware and browser hijacker can be removed using the Add/Remove programs utility which is located in the MS Windows Control Panel. So, if you’re running any version of Windows and you have noticed an unwanted application, then first try to get rid of it through Add/Remove programs. Scroll through the all list, and uninstall suspicious and unknown applications. To quickly find the latest installed programs, we recommend sort software by date. We suggest using the Malwarebytes Free which are completely clean your personal computer. The free utility is an advanced malware removal program developed by (c) Malwarebytes lab. This program uses the world’s most popular antimalware technology. It is able to help you get rid of browser hijackers, potentially unwanted software, malicious software, ad-supported software, toolbars, ransomware and other security threats from your personal computer for free. Once the download process is done, please close all software and open windows on your machine. Double-click on the icon that’s named mb3-setup. Further, press the “Scan Now” button to perform a system scan with this tool for the hijacker and other malware and adware. While the tool is checking, you can see number of objects it has identified as being infected by malicious software. When the Malwarebytes has finished scanning, it will open a list of all threats found by this tool. In order to delete all threats, simply click the “Quarantine Selected” button to begin cleaning your machine. Once the procedure is done, you may be prompted to restart the system. If MalwareBytes anti-malware cannot remove this hijacker, then we suggests to run the AdwCleaner. 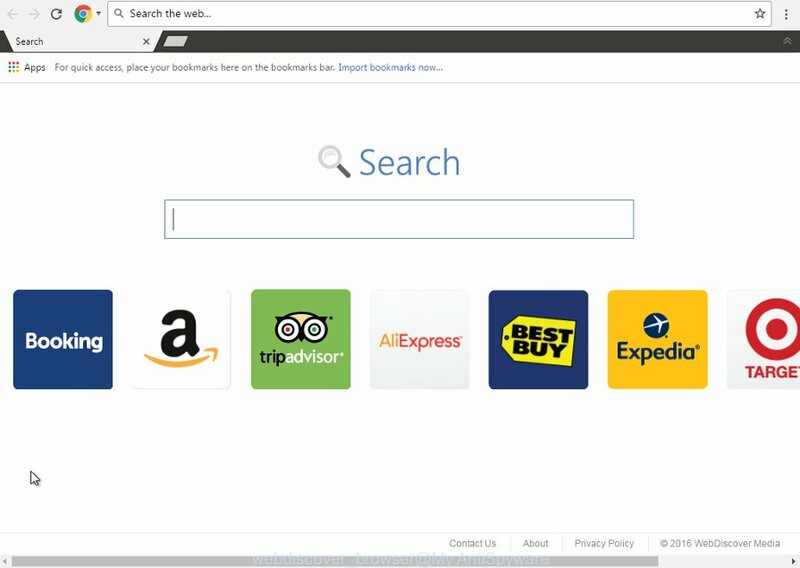 AdwCleaner is a free removal utility for browser hijackers, adware, PUPs and toolbars. Further, press “Scan” button to begin scanning your computer for the Web Discover unwanted program and other malware and adware. This task can take some time, so please be patient. When it has finished scanning your personal computer, you will be shown the list of all detected items on your computer as shown on the screen below. Review the report and then click “Clean” button. It will show a dialog box as on the image below. You need to press “OK”. When the clean up is finished, the AdwCleaner may ask you to reboot your personal computer. When your system is started, you will see an AdwCleaner log. In order to increase your security and protect your computer against new unwanted advertisements and harmful web pages, you need to run adblocker program that stops an access to harmful ads and pages. Moreover, the application can stop the show of intrusive advertising, that also leads to faster loading of web-pages and reduce the consumption of web traffic. In most cases, the default settings are enough and you don’t need to change anything. Each time, when you start your computer, AdGuard will launch automatically and stop pop-up advertisements, sites such Web Discover, as well as other malicious or misleading web-sites. For an overview of all the features of the program, or to change its settings you can simply double-click on the icon named AdGuard, that is located on your desktop. Now your machine should be free of the Web Discover browser. Delete AdwCleaner. We suggest that you keep AdGuard (to help you stop unwanted pop-up ads and unwanted harmful sites) and Malwarebytes (to periodically scan your computer for new malware, browser hijackers and adware). Make sure that you have all the Critical Updates recommended for Windows OS. Without regular updates you WILL NOT be protected when new browser hijacker, dangerous applications and adware are released. If you are still having problems while trying to delete Web Discover startpage from your browser, then ask for help in our Spyware/Malware removal forum.